I’m going to take a slightly different approach this year. Last year was the first year that I created crocheting goals for myself. And although there was a lot that I did not complete, I think in the first half of the year I got a lot more done than I may have in previous years. DONE – Sweet 16 Afghan – This is started and needs to be done soon because it will need to be mailed out as soon as I can. It’s already going to be late for her birthday. There’s just so much going on right now! Buddy’s Afghan – I have designed an afghan pattern in honor of each one of my new babies. As soon as the Sweet 16 Afghan is done, I need to get working on Baby #3’s. I’ve already done quite a bit of R&D (i.e. Pinterest pinning) and I’m pretty sure I know what I want to do. I even have the yarn. Now I just need to sit down and start work/writing the pattern. Christmas Stockings for Family – I think I’m just going to continue working on the Christmas items after the immediate projects are wrapped up so that they don’t just get put off until the end of the year and not get done again. I need to finish the stockings for the new baby and myself. Then I would like to do some embellishments on everyone’s stockings, including names and maybe some holly berries and leaves. Christmas Tree Skirt – I have a whole Pinterest board dedicated to this one and have not yet decided what I want to do for this exactly. However, I might see if I can get a plain, solid tree skirt on sale after the holidays this year to use as a backing for mine to lend more durability to it and potentially act as a background depending on what design I settle on. Afghan Christmas Present #1 – I have three different afghans that I want to make family members for Christmas gifts. Hopefully I can get them done in the first part of this year and then just block them and package them come Christmas next year. These projects are going to be difficult to post about while maintaining the Christmas surprise. I might have to come up with some creative pictures of extreme close ups and do some fun editing to disguise the true results. Curtains – We have a great big bay window in the new house and instead of putting up some boring curtains or sheers, I really want to crochet some pretty lace-like curtains that I can just slip onto some tension rods for a sort of 3/4 cover. Happypotamusses for kids – I thought about doing these for their birthdays or for another holiday through the year, but I think I’ll stick with making these and saving them for Christmas next year. The designer of this very cute stuffed animal has actually designed quite a few others, so I’m actually thinking about making the Hippo for Bubba, an Elephant for Sephy because she loves them, and something else fun for Buddy instead of just doing 3 hippos in different colors. Mitten Ornaments – Another small gift for the family members to make and save for next year. Top for myself – Finally on to non-Christmas items! Hopefully by this time I will have been able to loose some baby weight and can make myself something pretty. Dress for Sephy – I’d like to try again in making a dress for Sephy, this time in a very light weight yarn, or even thread. Parasol – I would still like to try and get this thing made. I have two different umbrella frames ready to use for it. Masquerade Masques – My sister is having a Masquerade Ball for her Halloween party next year and I want to make the masks that my Husband and I wear. I also have a whole Pinterest board for this one! It will be interesting to see how much of this I will actually be able to get done this year. Fifteen doesn’t sound like a lot on this list, but with 3 afghans plus a tree skirt that is basically a whole afghan itself, it is definitely going to be a challenge. The names will be back-stitched in yarn on the cuffs at the top, and then I’d like to add a holly berries and leaves embellishment to each of them. In any case, the new baby and my stockings will wait until next year (early in 2016) before I start them. I got nowhere near to what I wanted to accomplish this year with my crocheting. My work came to an abrupt halt in June when I got sick because I became pregnant with our third child. Three months later I was finally feeling a little better, but by then we were really trying to get our new house renovated and moved in. We are moved in now, though not even close to being unpacked and settled. And of course, now we are preparing for the holidays and the arrival of little #3. Obviously with a third on the way, living in a house that still needs a lot of work, and trying to get our old house ready to rent out, there is probably not going to be a lot of time to crochet in 2016 either. BUT I will be pumping 2-3 times a day again after returning to work, which is when I was able to get a lot of of crocheting done last year and early this year. So I do still have some things planned. Here is a rundown of things I am working on immediately, and where I ended up with the goals I had for 2015. I’ll post again later with what I want to accomplish for 2016. I did get a few custom orders completed through my Etsy shop along the way but not a whole lot else. 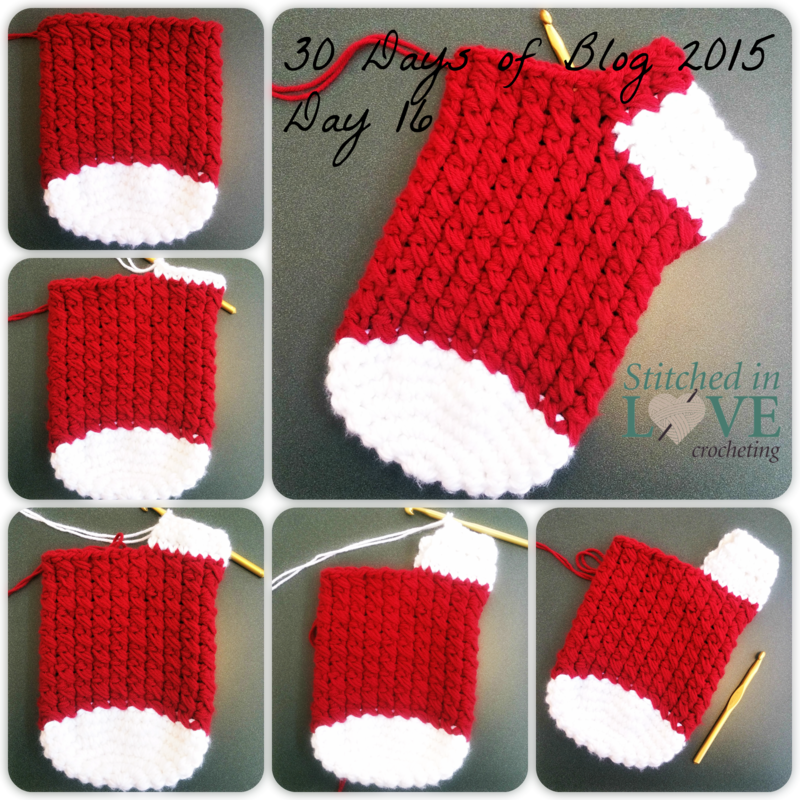 Christmas Stockings – Two done for the kids, working on Husband’s now. Baby #3 and I may have to wait until next year. Christmas Gifts – Working on a few small/quick gifts for family. Will post on this after all the family get-togethers are done for the holidays. Sweet 16 Afghan – This needs to be started as soon as the stocking and Christmas gifts are done because it will need to be mailed out very soon after the first of the year. Buddy’s Afghan – I have designed an afghan pattern in honor of each one of my new babies. As soon as the Sweet 16 Afghan is done, I need to get working on Baby #3’s. I’ve already done quite a bit of R&D (i.e. Pinteresting) and I’m pretty sure I know what I want to do. I even have the yarn. Now I just need to sit down and start work/writing the pattern. ADDED (Custom Order) – Baby Afghan Success! See June 6th 30 Days of Blog Post for this one. ADDED (Custom Order) – Second Baby Afghan Success! I’m sad about this one because I do not think that I took a picture before I delivered it. ADDED: Baby Gift #1 – This was the Strawberry Cocoon and Beanie Success! ADDED (Custom Order) – Baby Gift. Surprise gift to be posted at a later time. Success! I’m sad about this one because I do not think that I took a picture before I delivered it. ADDED: Baby Gift #2 – Was in progress in May, but I don’t even remember what this was right now! Finish writing Cuffs and Monkey Patterns – Cuffs done. Monkey on hold till Fall. I never did get back to the Monkey pattern. But the boot Cuffs pattern did get finished and posted in my Ravelry store. I even had a lady contact me about it because she is doing a class on cable stitches at a retreat and wanted to use my pattern for it. So I have seen multiple pattern sales as a result of that. Christmas Stockings for Family (4) – On the immediate list. Baby Gift #2 – I’ve had this done for awhile and I’m sad to say I keep forgetting to mail the darn thing! Top for myself – (Laughing.) Not a chance. It wouldn’t fit me right now anyway. Maybe this Spring or Summer. Christmas Tree Skirt – Sadly this one did not get done yet either. Afghan Christmas Present #1 – Nope. Afghan Christmas Present #2 – Nope. Happypotamusses for Sephy and Greyson – This is another one I’m really sad about. I really wanted to get these done for them. Maybe I’ll make it a trilogy and give one to each of the three kids for Christmas next year. Sweet 16 Afghan – On the immediate list. Mitten Ornaments – Replaced with another quick project for Christmas gifts on the Immediate list. I would still like to do these for next year. So there we are. Here’s hoping that 2016 will leave me feeling more accomplished with the projects I want to do! I never got caught up from missing last weekend, and then I got sick this weekend. So it looks like I’m about four days down on the month. 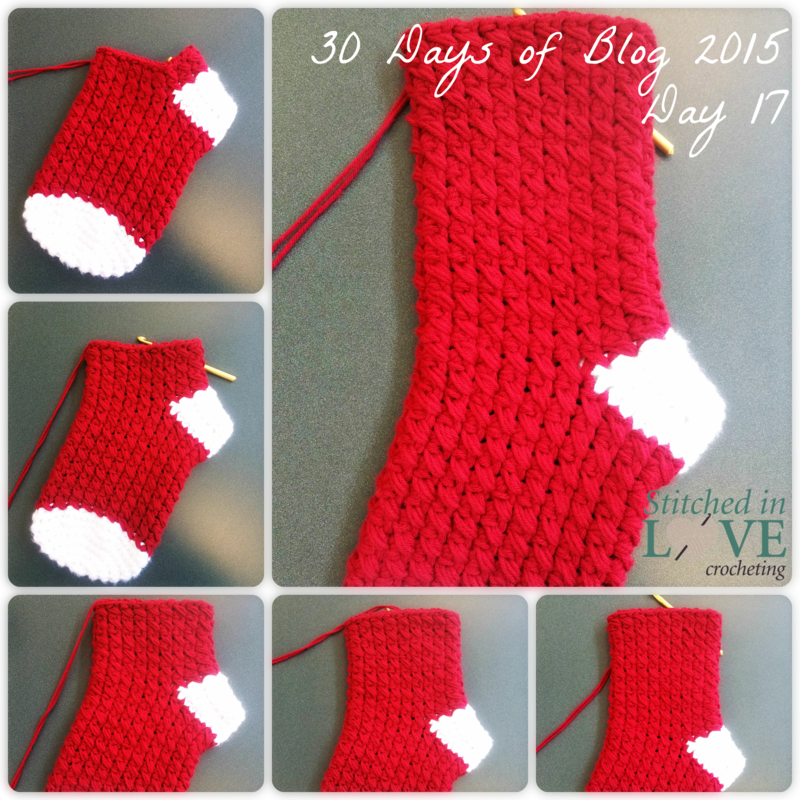 I got the last of the red done on this stocking and started the cuff today. I really should be able to finish this thing up tomorrow. I did it again on this one. I had problems in the heel area that slowed me down. This time the problem was because I skipped a stitch on the last row before starting the heel. I didn’t notice until I’d finished the heel and started back on the last row. So I had to rip the heel out and go back and fix my work.